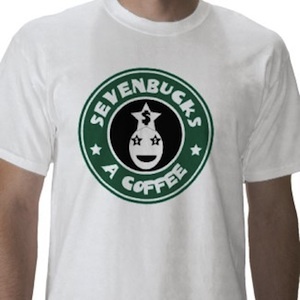 This funny “Sevenbucks A Coffee” t-shirt of course with the logo style trying to make fun of Starbucks and there is a lot of truth in it anyways. I am sure that people are gone laugh when they see you wear this shirt and maybe even buy you a coffee. Go order you own Sevenbucks A Coffee T-Shirt.